One of the most satisfying things about living in a city that is so fluidly ever-transforming is watching the metamorphosis of each individual neighborhood and what thrives within it. Growing inside the cultured corners of this massive melting pot are innovative ideas. There are these light bulbs going off left and right in this city, and with the right execution, a trendy business goes up here, another there, and a district is renewed. At the intersection of 11th and Hope Street, the streets of South Park are growing and thriving, and for some time, one of the only things that it seemed to be missing was an outstanding fashion retailer. This is precisely where successful online fashion boutique Le Box Blanc decided to call home with their first brick and mortar shop. 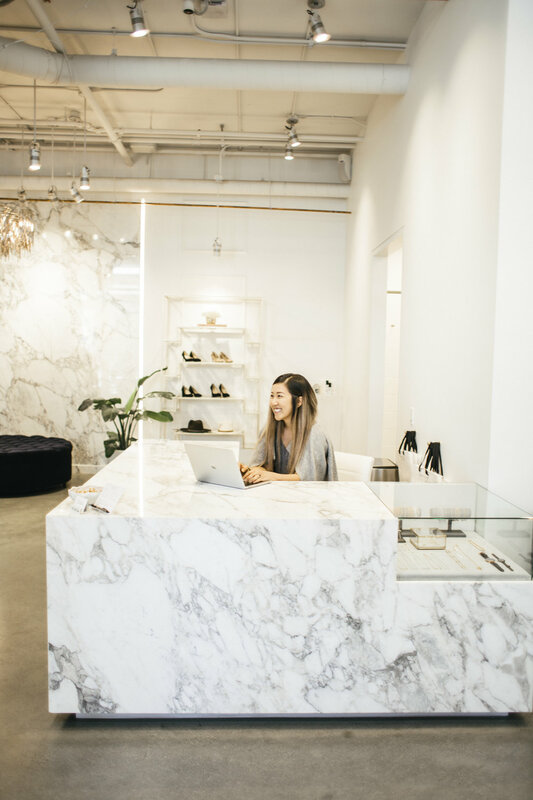 The creative minds behind Le Box Blanc, Emily Park, and Esther Paik opened their storefront in South Park last year. Both Park and Paik started with careers in accounting within the fashion industry where they gathered valuable back-end knowledge that remains to be one of the keys to their success. It’s not that they didn’t enjoy their career paths, but craved to do something more and create a business of their own. Before they knew it, the opportunity arose, and the two came together in a harmonious partnership. Before Le Box Blanc, Park had been working in the area for years and became very familiar with the neighborhood. Conveniently around the corner from what became their current storefront is the location in which the gals established their initial workspace when the boutique was only online. The sort of shopping experience to be had at Le Box Blanc is unmatched. When it comes to the thoughtfully curated, slightly elevated style of what they hang on their racks, Le Box Blanc organizes their selection based on a range of items including but not limited to: closet builders, closet refreshers, and special pieces that are simply meant to be noticed, all by handpicked designers with a similar chic and refined flare. 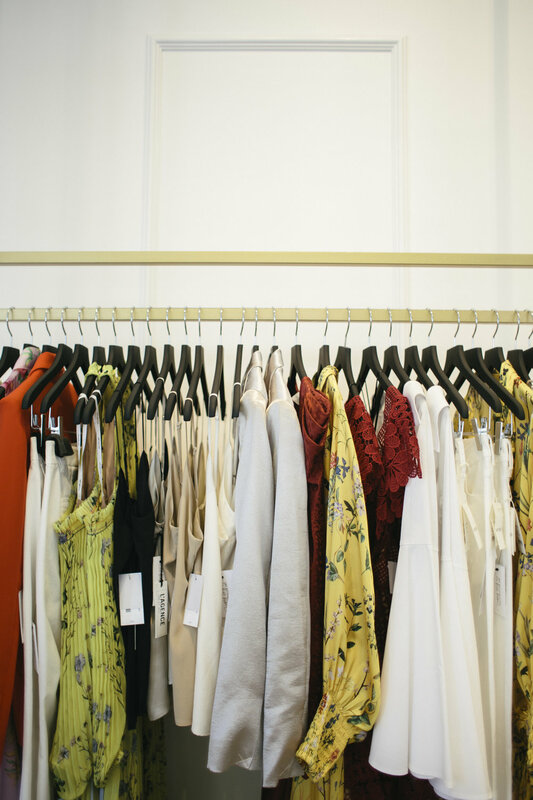 Personal shopping at Le Box Blanc is exactly that—personal. The ladies mentioned that with much of their buying, they often have certain client’s preferences in mind whether it be a certain fit or design. No one’s a mind reader, but one step in their dressing room and your stylist will have you wondering. In case your full wardrobe needs a little TLC, Le Box Blanc also provides in-home complete closet overhaul and organization. Dealing with a time crunch? 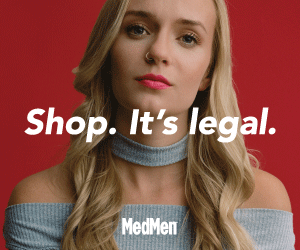 Free same-day delivery is also available to local businesses and residences for those times where you just need that dress or that blazer right now. Remember what was said about full-amenities? Le Box Blanc is open Monday through Friday from 11am-6pm, 11am-5pm on Saturday, and is open for appointment only on Sunday. The next time you require a new fit, go visit Emily, Esther, and their amazing team.